My efforts to spread the good news of Linux continues with this somewhat basic but capable Gateway laptop. The name is a little odd and not very memorable: This is the NE56R41u… sounds awesome… It seems that not everyone can have naming creativity. Admittedly, in my hasty search on the web for other individual Linux install experiences, I didn’t see much positive. I expected there to be some fiddling around with the machine in order to install openSUSE Linux on the Gateway computer. Having previously used the SUSE Imagewriter to “burn” the openSUSE Leap 42.2 to a USB Flash drive. I wanted to start out by just plugging the USB drive in and seeing what happens on a cold boot. Of course, nothing happened as it booted to a broken Windows install. I had to get into the BIOS but the designers of this machine felt it best not to let you know on screen how to get into the system firmware. A little research online gave me a few hints as to how to get into it and what ended up working was to press and hold F2 immediately after you power on the machine. Within the BIOS configuration utility, I moved over to the Boot options and set the USB HDD as first on the boot order and attempt installation. The result was, the system would not boot from USB stick but rather just sat on the Gateway Logo splash screen. It appears that I cannot boot from USB with UEFI active. Thankfully, there is a toggle to switch to Legacy BIOS boot mode so that I can actually get the thing to boot from USB. One little quirk that I don’t understand is, when you put the BIOS in legacy mode, you can’t change the boot order. Set the boot order in UEFI and switch to Legacy Mode. Not a big deal, just seemed a bit annoying. – Increased Swap Space to 4 Gb instead of the default 2 Gb. – Increased The / (root) partition from 10Gb to 30Gb. I do not like running out of space on the root partition. I am a fan of using SSH for remote access and file transfers, so prior to committing the install, I opened the SSH port and activated the service so that I could remotely finish configuring the machine. Upon initial boot, everything worked, there was not a single issue with any features or component of the machine. It all just worked without any tweaking or special configuration adjustments. KDE Plasma Desktop ran smooth and peppy, didn’t have to tweak any of the desktop effect settings or deactivate anything to improve performance, I was very pleased. Once the system settled after boot, I used my Base Application List for multimedia package install and added Google Chrome Browser to ensure that there would be no issues with the web experience. I also installed Telegram and I was done. Smooth installation process, smooth operation and it is better than new thanks to all the efforts of the contributors of openSUSE and related projects; simply splendid. Nothing inside this plastic shell is particularly impressive, it is a basic machine but runs very well and is a perfect fit for the needs of its owners. openSUSE Leap 42.2 a perfect fit for this Gateway NE56R41u laptop. It has a terribly unmemorable name but functions very well. Through much testing, there were no issues using this machine. Everything is stable and rock solid. 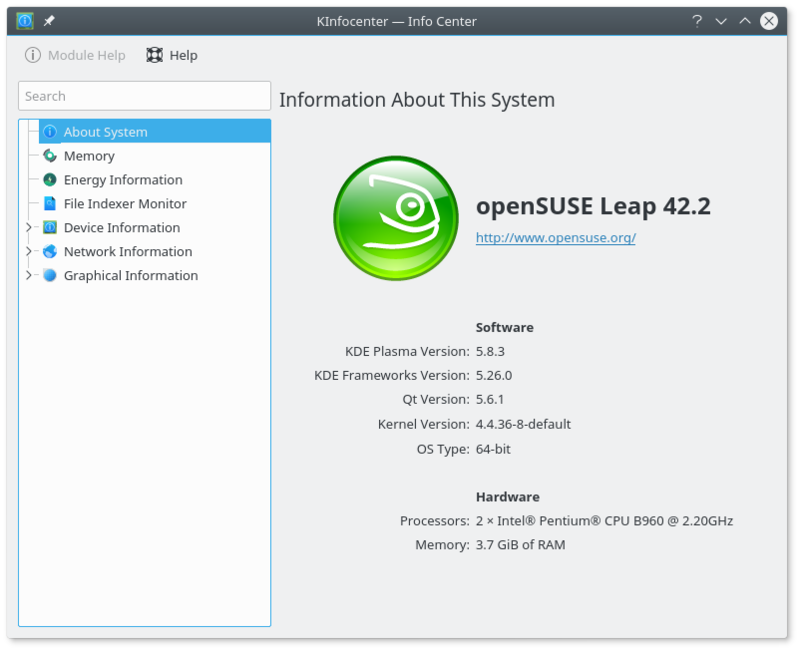 Though this is an older machine and would be the opinion of some that it should have a “light weight” desktop environment used, KDE with the default openSUSE configuration, runs very well with nothing turned off or disabled. It is only using about 655Mb of RAM leaving plenty left over for applications. With the wide array of application availability, smooth installation and problem-free operating experiences, this is yet another reason why openSUSE should be your number one go-to operating system of choice for you and your friends or family. If you are going to help them with their computer problems, may as well make it as painless as possible for yourself.